Artist Profile - Alex Shaw - Welcome to the World of Greg Bennett Design Acoustic Guitars! : Welcome to the World of Greg Bennett Design Acoustic Guitars! Alex is an 11-year old lead guitarist who only picked up the guitar for the first time about three years ago. In his short time playing, Alex has been given many opportunities to perform at local events and for charities in the area. He was recently seen volunteering his time and talents at the “Rock Out Kid’s Cancer Music Festival” benefit, where he helped raise money for the Kid’s Cancer Foundation. Alex was honored to share the stage with not only the headliners, Big Vince and the Phat Cats, but also with world renowned saxophonist, Clarence Clemons, a long time member of Bruce Springsteen’s E Street Band, just before his passing. Alex also supports other charitable organizations such as The Relay for Life, The American Cancer Society, and Cystic Fibrosis, to name a few. 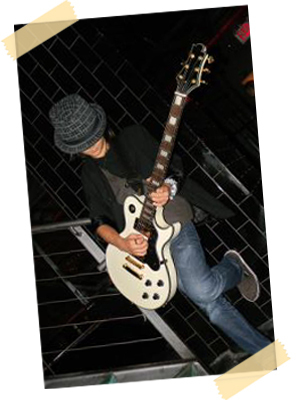 In 2009, Alex became Samick Music’s youngest artist endorser and proudly plays Greg Bennett designed guitars by Samick. As an artist with Samick Music, Alex had the privilege to attend both the 2011 & 2012 NAMM Show (National Association of Music Merchants) in Anaheim California, where he performed at the Samick booth. Favorite city to tour in: Hopefully one day in Los Angeles and NYC, but for now, my hometown! Favorite type of music growing up: Jonas Brothers, but then I discovered classic ROCK!! My greatest love: Family, friends and music! Oh, and I can’t forget my pets! Favorite food: My grandma’s Fettuccini Alfredo with shrimp and scallops and good old-fashioned Burgers on the grill! My motto: Let your light shine…the world is watching.